The Hispanic Association of Colleges and Universities corporate partner Deloitte presented the Jorge A. Caballero Student Leadership Award to Nashali Ruiz Esteves, an accounting major from the University of Puerto Rico, Mayagüez on Oct. 7, 2018, during the Power Lunch of HACU’s 32nd Annual Conference. The Student Leadership Award, named after Jorge A. Caballero, senior partner at Deloitte Tax, LLP, was a $10,000 award presented to Ruiz Esteves for demonstrating leadership qualities through academics and community involvement. As part of the award presentation, Erik Linares a former recipient of the Leadership Award, spoke of the opportunities that Deloitte has given him through his internship and his career aspirations to become a CPA. HACU thanked all of its conference sponsors and recognized Deloitte and American Student Assistance during the Power Lunch for their support and contributions. 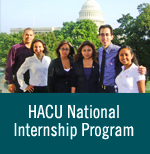 HACU President and CEO Antonio R. Flores with Nashali Ruiz Esteves. student University of Puerto Rico, Mayagüez; Jorge A. Caballero, senior partner at Deloitte Tax, LLP; and Maria Harper-Marinick, Chancellor, Maricopa Community Colleges, member of HACU’s Governing Board and convener of the Power Lunch. Chancellor, Maricopa Community Colleges, member of HACU’s Governing Board and convener of the Opening Plenary.